As explained elsewhere, it was my father’s brother, Tony BIRD, who wrote a semi auto-biography which has never been published called “A load of codswallop”. In it he included the phrase 'William BIRD of Newnham' which had always been taken as gospel by the family. I therefore had a good starting point for researching him and his ancestors. 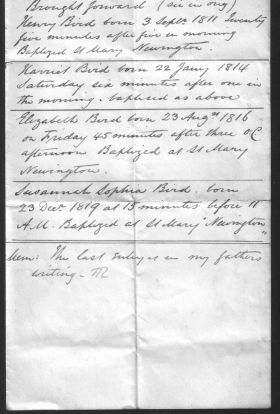 There is an IGI entry, without source information, of a “Wm BIRD born about 1773 Newnham” but I was unable to confirm this at the Northamptonshire Record Office where we went to see the Parish records. Indeed, I made a rash assumption which lead down the wrong garden path for too long. In the semi auto-biography. Tony wrote rather derogatorily about "William BIRD of Newnham who lagged rather behind in the landed gentry stakes.” Was this true or just tittle tattle passed down through the generations ? I ascertained that although he may not have been born rich or the owner of property, before he died he had a veritable estate of long leasehold properties on which he and his heirs were entitled to live off the rent from the tenants for nearly 80 years. William BIRD was born about 1757 and married his wife Sarah Elizabeth ELLIOTT in 1799 at St Dunstons & All Saints in Stepney. Sarah was born in Newnham, Kent NOT in Northamptonshire. One of them must have either come from a wealthy family or he had previously been a very successful builder as he purchased the right to build a number of properties in Lambeth between 1820 – 1824 (£1,000 was to be spent on building costs in the first five years and another £1,000 by the end of the following fifteen years) and he was then granted 80 year leases which allowed him and his descendents to recoup rents received from the tenants of the properties. One of the properties he built is in the photo above. We don’t yet know where he got the capital from and I will need to research more about his birth and where he was born. William and Sarah lived in one of the Lambeth properties he had built - 8 Clapham Road (she continued to live there after his death on both the 1851 and 1861 census). WILLIAM HENRY ELLIOTT BIRD was born on 26th June 1798 in St Georges, Queens Square, Bloomsbury. 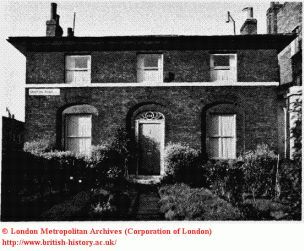 He died, aged 72, on 19th January 1870 at 8 Elizabeth Place, Brixton Road, Lambeth (another of the Lambeth properties his father had built) of bronchitis. No other information is yet known about him. 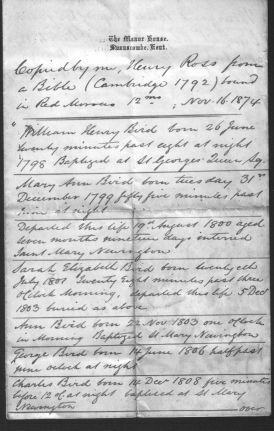 MARY ANN BIRD was born on 31st December 1799 but died while still a baby on 19th August 1800 in St Mary, Newington. Named after his wife, SARAH ELIZABETH BIRD was born less than a year after Mary Ann BIRD’s death on 20th July 1801 but sadly she died before her third birthday on 5th December 1803 in St Mary, Newington. ANN BIRD was born on 22nd November 1803 in St Mary, Newington. She went on to marry Francis ROSS who died in 1838 just before the birth of their son Henry ROSS. She probably died after 1841 at which time her son, Henry ROSS, became involved in The Ross Bird Mystery. GEORGE BIRD was born on 14th June 1806 in Lambeth, Kennington, Surrey and he became known as George BIRD of Chessington Court Farm. CHARLES BIRD was born on 14th December 1808 in St Mary, Newington. On the 1861 census (52 years old), he is shown as married (who to ?) and living with his aged mother Sarah Elizabeth BIRD (85) at 8 Clapham Road, Lambeth. No other information is yet known about him. HENRY BIRD was born on 3rd September 1811 in St Mary, Newington. No other information is yet known. Did he marry Caroline BIRD (nee BIRD) as I have a possible birth certificate in 1845 for a little girl – says her father is a builder which might fit ? However this seems unlikely as the marriage was in Whitechapel (1838). HARRIOT BIRD was born on 22nd January 1814 in St Mary, Newington. She married John COVENEY of Swanscombe and they effectively adopted (not legally) Henry ROSS (son of Ann BIRD above). ELIZABETH BIRD was born on 23rd August 1816 in St Mary, Newington. She married a Thomas ROSS in 1843 but I have, so far, failed to find a connection between him and the Francis Ross who her sister, Ann, married. SUSANNAH SOPHIA BIRD was born on 23rd December 1819 in St Mary, Newington. She died 1n 1839 at Clapham Road Place. Details of all the above births including the time of each birth was transcribed by Henry ROSS from a family Bible on 16th November 1874. The last entry was in the writing of Henry ROSS’s father. Presented to William Bird Esqr. William BIRD died in October 1833, aged 60. I have a copy of his Will which runs to 8 pages setting up trusts for his children and their children to benefit from this income. His wife, Sarah Elizabeth BIRD, who had been born in 1778, died of “old age” in 1866, aged 88.